Climb for a Cause to the Roof of the World! On this adventure, every step you take will have a very special meaning as you walk to raise funds for the charity of your choice. This ‘bucket list’ trek is a ‘must do’. What better reason to take up the challenge now than assisting others through your fundraising. Join us for this ‘holiday with heart’ in 2018 and make a difference to your world. On arrival to Kilimanjaro International Airport in Arusha, Tanzania, you will be met and transferred to your accommodation. This afternoon,a full brief on what lies ahead will be conducted, as well as a full kit check. This morning you are transferred to the starting point of the Kilimanjaro climb, the Lemosho Trail where you meet the rest of your crew. 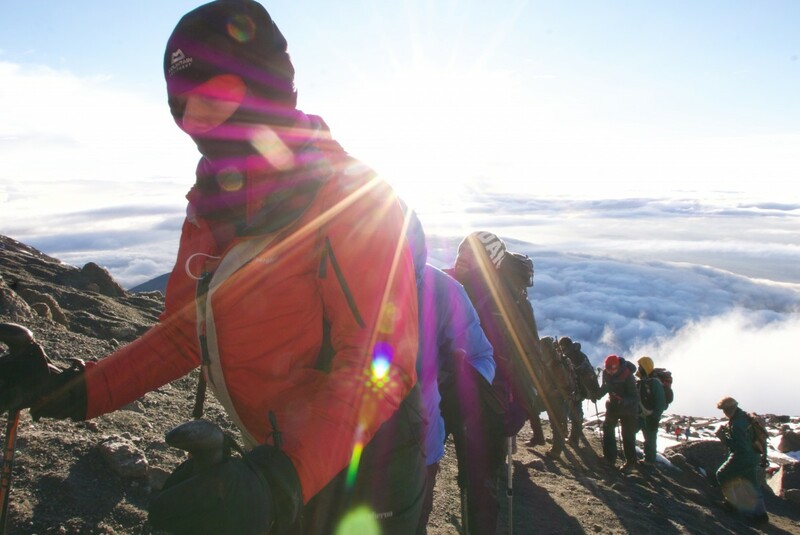 Considered by many to be the most beautiful and scenic route to climb; you pass through tropical montane rain forest to the snows of Kilimanjaro. 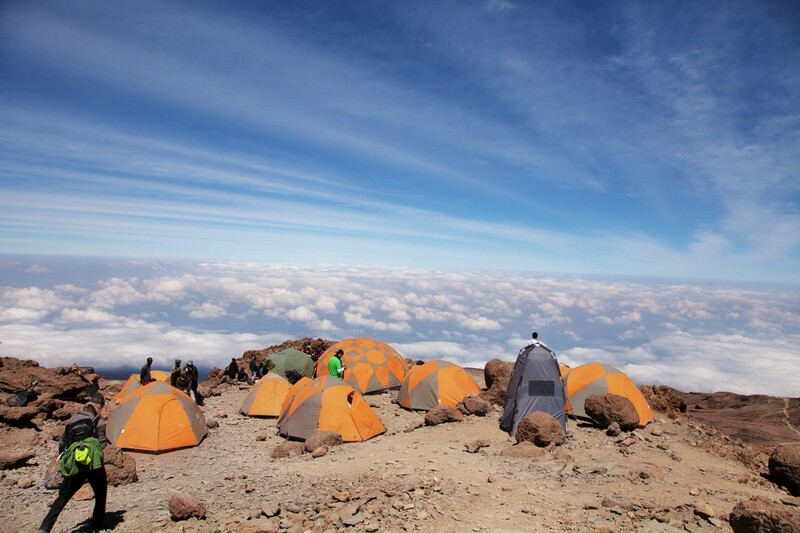 You will be climbing with excellent guides, a cook, camp sta and porters. Accommodation throughout is in mountain tents, and all camping equipment is provided to a high specification, including sleeping bags, linen, thick foam mattresses to ensure as comfortable a night sleep as possible, a toilet tent, tables and chairs, 2-way radio and mobile telephones to maintain communication with the Arusha base. You set o at a leisurely pace into the afro-montane forest. Lunch is taken on the trail and camp is reached mid-afternoon. After an early start you ascend the forested slopes of Lemosho, through Podocarpus and Juniper forests, onto the heath zone and the moorland of the Shira Plateau, one of the most fascinating areas of the mountain. Lunch is taken on the trail and you arrive in camp by mid-afternoon. Crossing the Shira plateau can be one of the most scenic parts of the trip and this morning you hike for around 3 – 4 hours to the lunch point. 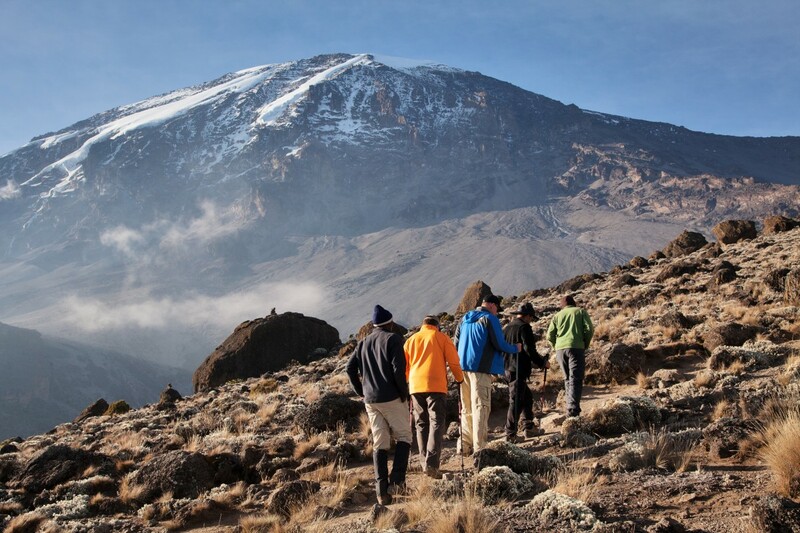 After lunch you ascend to Shira 2 Camp, arriving mid-afternoon.This is a good day for acclimatisation with the option of an afternoon walk with your guides. junction which brings us up to the Arrow Glacier at an altitude of 4871m. You now continue down to the Barranco Hut at an altitude of 3910m. Here you rest, enjoy dinner, and overnight. This day is very important for acclimatization and will help your body prepare for summit day. You are rewarded for our e orts with spectacular views of the Barranco Valley. After the last two half days, you now have a relatively long day to Karanga Camp. 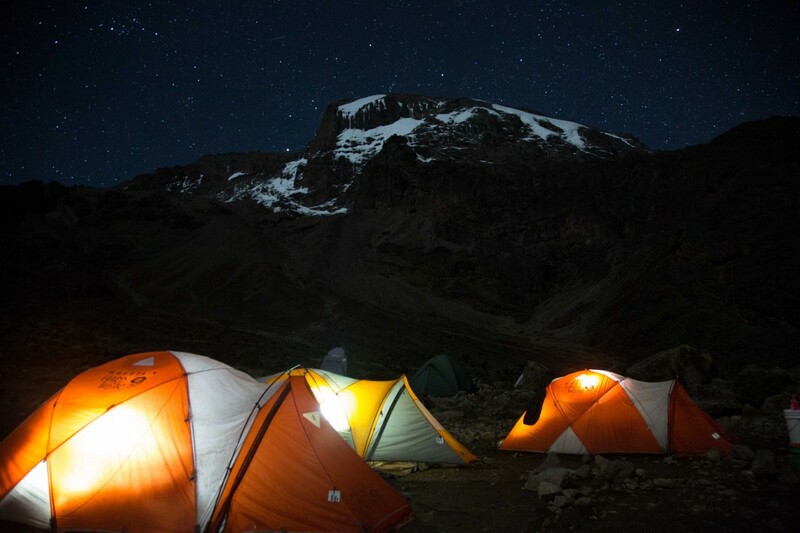 The selection of Karanga Camp is strategic – signi cant time at altitude is essential for safe acclimatisation and in the late afternoon you arrive in camp. Sunsets here are particularly spectacular with views of the southern glacial valleys and ice elds towering 1000 meters above you. Today is a half day walk through to Barafu. About 2 hours from Karanga you come out on the Barafu path (part of the Mweka Trail). It is a further 1 to 2 hours to our camp at Barafu. The last stage to Barafu Hut is quite steep, and as always you are advised to take it as easy as possible. Being as relaxed as possible both mentally and physically is the best advice (physical relaxation is often as di cult as mental relaxation!) This afternoon presents an opportunity for you to rest up before your assault on the summit. Late in the afternoon you will be briefed for the night ascent. You depart for the summit at around midnight. It will take upward of 7 hours to reach the top. Once on the rim at Stella Point (+6 hours) you traverse onward to Uhuru Peak (5,896m) where you catch the sunrise from the rooftop of Africa! You are there! 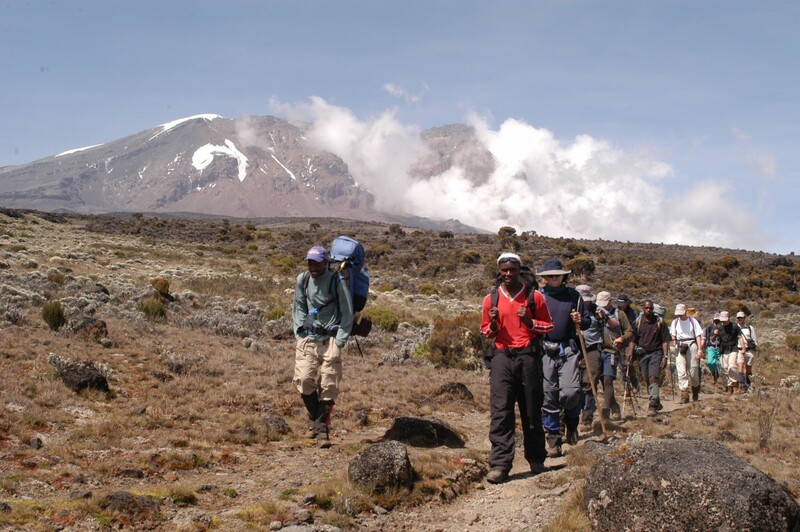 You then descend via Stella Point to Mweka Camp for an overnight stay (3,100m). Overnight – Mweka Camp (3,100m) – Full board basis. This morning you make the final descent to the Mweka Gate from where you are transferred to the Arusha Hotel for an overnight stay. This is a good opportunity to recoup and re ect on the achievements of the week just past. • Pre-Adventure Strength and Conditioning Program prepared by our Aurora Exercise Physiologists speci cally for this adventure – 8 weeks and 2 fully supervised sessions for Brisbane trekkers or our 12 week Remote Preparation Program for interstate trekkers. • 2 nights accommodation in Mt Meru Hotel at the beginning and end of the adventure on a twin share basis and meals in the hotel. • All transfers and transport during and accommodation and food on trek. • Most of your trekking gear (eg use of day pack). • Return international airfare to Mt Kilimanjaro airport and in country domestic ights. • Personal expenses such as phone call costs and alcoholic beverages at the hotel in and tips to local crew. • Visa fees and airport taxes.